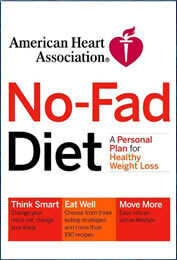 The American Heart Association created their weight loss book, The No Fad Diet, in an attempt to help dieters who may be confused by the range of diet plans that are available. The book provides simple quizzes that can help dieters work out what is the most suitable plan for them. Basically this is a conventional low calorie and low fat diet that is promoted as a heart healthy plan and a way to lose weight gradually. Think smart – change negative thinking and eliminate bad habits. Eat well – take in less calories than you use. The AHA provides a calculator to help determine your daily calorie requirements. Move more – incorporate some movement into your daily routine. This is one of the keys to maintaining weight loss. Vegetables, fruits, whole-grain products and fat-free or low-fat dairy products. Fish is recommended at least twice a week as research indicates that this may reduce the risk of coronary artery disease. Find more low Calorie recipes here. At least 30 minutes of moderate intensity activity are recommended on most days such as these resistance training exercises. The No Fad Diet retails for $24.95. Takes into account differences in calorie requirements depending on gender and activity level. Gives dieters a choice of three different eating plans. Provides two weeks of sample menus and recipes. Considers the importance of exercise and psychological factors for successful weight loss. Can help dieters break out of the mentality of crash dieting to a more sustainable lifestyle approach to weight loss. The advice offered is contrary to much recent knowledge and scientific research about dietary risk factors for heart disease. Includes foods that contain trans fats, which have been linked to heart disease: The National Academy of Sciences has stated that there is no safe level of these fats for human consumption. Many dieters have difficulty managing appetite on low fat diets due to the potential disruptive effects on blood glucose balance. In these individuals unstable blood glucose may exacerbate insulin resistance, which may actually increase the risk of diabetes and heart disease. The advice to eat less and move more clearly does not work for many dieters especially as a long-term approach. While The No Fad Diet may produce weight loss simply due to the calories in, calories out equation, dieters who are interested in reducing their risk of heart disease and other chronic illnesses are advised to do their own research into the factors involved in these conditions. The AHA advises dieters to avoid trans fats, which are strongly implicated in heart disease, however they include items in their meal plans that contain these fats such as margarine, wafer cookies, and donuts. Low fat diets may work for a small group of dieters but experience has shown that many dieters have difficulty with appetite control on these plans and if the diet cannot be sustained then weight is regained easily.